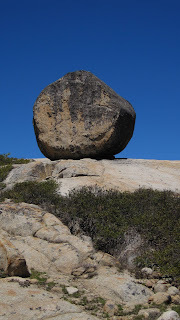 There is something really wonderful about walking through the Sierra and coming face to face with a massive boulder that looks as if it has been delicately placed there by the hand of God. The one in this photo was on top of a bare granite ridge overlooking Spicer Reservoir, and is about ten feet in diameter. I can't imagine how much it must weigh. You might think that it had rolled here from somewhere else---but there's nowhere else to roll from. It was on top of the ridge--and it was all downhill from there. Nope, it was dropped on top of the ridge by a glacier that picked it up miles away and carried it this far. And when the glacier finally melted, this massive boulder was let down easy--delicately balanced on top of the ridge for all eternity--or least the foreseeable future. The name for these rocks is "erratics," meaning that they don't always make sense in relationship to their surroundings. Sometime they are of a complete different geologic make-up, and only the slow glacial train can account for their location. But I also think of them as iconoclasts--a bit like us backpackers. We often march to a slightly different drumbeat, and find ourselves where few have ever gone before. Or at least we like to think of ourselves that way. And much like the glaciers, we aren't exactly speed demons. With the speed at which we hike, it takes us a long time to get anywhere, too. So we hike for hours, cover a few miles, and the sit down on top of a ridge, or along a stream, and rest for a while.